HVAC Control System Market size is set to exceed USD 25 billion by 2024; according to a new research report by Global Market Insights, Inc. The global shipments are set to grow at a CAGR of over 25% between 2018 and 2024. HVAC control system market will grow significantly over the forecast time span due to an increasing need to reduce energy consumption. Energy efficiency is one of the key concerns in every ecosystem, for both new construction and renovated buildings. These systems use technologies, such as Demand Control Ventilation (DCV) and Variable Air Volume (VAV), that can be extended with smart devices such as smart thermostats and monitoring tools. These systems allow the monitoring and analysis of the data pertaining to energy consumption and future energy requirements thereby fueling HVAC control system market. The growing use of smartphones and the proliferation of IoT devices in households are driving the HVAC control system market growth. The integration of these systems with the smartphones allows remote access that enhances comfort and user experience, propelling the demand for these systems. Furthermore, the increasing use of sensors is allowing the software integration with these systems, making them more intelligent. Lack of awareness regarding these systems will restrain the HVAC control system market growth. The initial cost of installation is high, discouraging the users to implement these systems. However, governments of several countries are setting up guidelines to encourage users and spread awareness regarding long-term cost savings by the use of these systems. Technological advancements such as geothermal heating & cooling in these systems is one of the key trends influencing the HVAC control system market. These systems are efficient eco-friendly HVAC solutions, as these reduce the carbon footprint substantially. These systems draw energy from the ground under the establishment and are durable & low-maintenance. Zoning systems are being increasingly used in large establishments such as commercial buildings and industries. These units are particularly designed to cool the isolated units of a building. Smart thermostats are expected to hold a considerable revenue share in the HVAC control system market as these can be used with home automation devices and are highly efficient. They can be used in a standalone mode by integrating it with other smart home devices. Companies including Ecobee, Honeywell, and Nest Labs are developing differentiated products that use technologies such as geofencing to enhance the performance. Manufacturers in the market are implementing the technology to enhance functionality of the products and improve user experience. For instance, the Emerson Sensi allows integration with smart devices such as Alexa Voice Assistant and Apple Home Kit. The industrial HVAC control system market is anticipated to grow significantly over the forecast time span owing to high requirements from industrial buildings to save energy and reduce costs. These systems intelligently match the energy generation requirements with usage & distribution. The companies in industrially-developing countries including China, Japan, and India are focusing on providing a conducive work environment to enhance the efficiency of employees, propelling the demand for these systems. 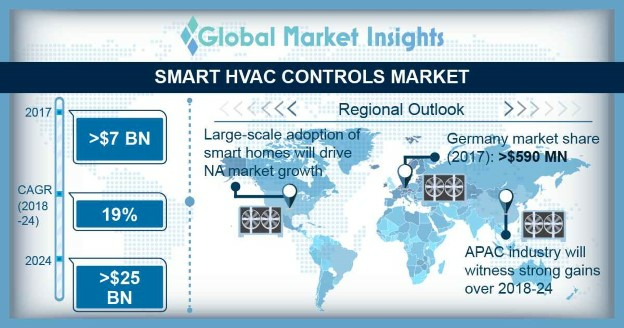 The North America HVAC control system market is will grow rapidly over the forecast time span due to the large-scale adoption of smart homes in this region. The growing demand for enhancing energy efficiency in the buildings is encouraging users to implement these systems in new buildings and retrofits. According to the U.S. Energy Information Administration (EIA), in 2015, about 40% of the total energy consumption in the U.S. was by commercial and residential buildings. Key vendors in the HVAC control system market comprise Honeywell International, Johnson Controls, Lennox, Ecobee, Siemens, Emerson Electric, Schneider Electric, and Distech Controls. The companies are increasingly investing in developing differentiated solutions to gain a competitive advantage. Companies including Nest Labs are connecting these devices to centralized servers with BI capabilities to enhance user experience. The technology providers such as Google are entering the industry to develop high-end products. For instance, Google has developed Google Nest and Google Nest E that offers app-based model and compatibility with smart home devices.